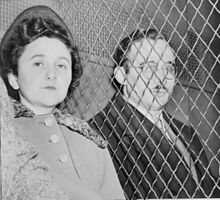 Julius dan Ethel Rosenberg adalah dua warga negara Amerika Serikat yang dieksekusi karena menjadi mata-mata Uni Soviet. Mereka telah memberikan informasi tentang teknologi militer rahasia tingkat tinggi dan prototipe mekanisme yang berkaitan dengan bom atom, yang sangat berharga bagi program senjata nuklir Soviet. Mereka juga menyediakan informasi rahasia tentang radar, sonar, dan jet untuk Uni Soviet. ^ Radosh, Ronald (10 June 2016). "Rosenbergs Redux". ^ "What the K.G.B. Files Show About Ethel Rosenberg". The New York Times. Aug 13, 2015. ^ Radosh, Ronald; Klehr, Harvey; Haynes, John Earl; Hornblum, Allen M.; Usdin, Steven (17 October 2014). "The New York Times Gets Greenglass Wrong". Weekly Standard. Diakses tanggal 5 October 2016. Feklisov, Aleksandr, and Kostin, Sergei. The Man Behind the Rosenbergs. Enigma Books, 2003. ISBN 978-1-929631-24-7. Schneir, Walter, and Scheir, Miriam. Invitation to an Inquest. Pantheon Books, 1983. ISBN 0-394-71496-2. (Prancis) Florin Aftalion, La Trahison des Rosenberg, JC Lattès, Paris, 2003. Alman, Emily A. and David. Exoneration: The Trial of Julius and Ethel Rosenberg and Morton Sobell – Prosecutorial deceptions, suborned perjuries, anti-Semitism, and precedent for today's unconstitutional trials. Green Elms Press, 2010. ISBN 978-0-9779058-3-6 or ISBN 0-9779058-3-7. (Inggris) Virginia Carmichael, Framing history: the Rosenberg story and the Cold War, University of Minnesota Press, 1993. (Prancis) E. L. Doctorow, Le Livre de Daniel, Robert Laffont, 1980, ISBN 978-2-221-00506-4. (Inggris) E. L. Doctorow. The Book of Daniel. Random House Trade Paperbacks, 2007. ISBN 978-0-8129-7817-9. (Prancis) Howard Fast, Mémoire d'un Rouge, éd. Payot & Rivage. Intéressant, traite de toute la période de l'avant seconde guerre mondiale et après (MacCarthysme, etc.) aux États-Unis. Nombreux témoignages. Plusieurs passages sur les Rosenberg notamment pp. 349 à 359. (Inggris) Alvin H. Goldstein, The Unquiet Death of Julius and Ethel Rosenberg, 1975. ISBN 978-0-88208-052-9. (Prancis) Gérard A. Jaeger, Les Rosenberg. La chaise électrique pour délit d'opinion, Le Félin, 2003. Meeropol, Michael, ed. The Rosenberg Letters: A Complete Edition of the Prison Correspondence of Julius and Ethel Rosenberg. New York: Garland Publishing, 1994. ISBN 0-8240-5948-4. Meeropol, Robert and Michael. We Are Your Sons: The Legacy of Ethel and Julius Rosenberg. University of Illinois Press, 1986. ISBN 0-252-01263-1. Chapter 15 is a detailed refutation of Radosh and Milton's scholarship. "David Greenglass grand jury testimony transcript" (PDF). National Security Archive, Gelman Library, George Washington University. August 7, 1950. Diakses tanggal July 16, 2015. Radosh, Ronald and Joyce Milton. The Rosenberg File: A Search for the Truth. Henry Holt (1983). ISBN 0-03-049036-7. Roberts, Sam. The Brother: The Untold Story of the Rosenberg Case, Random House, 2003, ISBN 0-375-76124-1. Roberts, Sam (July 15, 2015). "Secret Grand Jury Testimony From Ethel Rosenberg's Brother Is Released". The New York Times. Diakses tanggal July 16, 2015. (Inggris) Sam Roberts, The Brother: The Untold Story of Atomic Spy David Greenglass and How He Sent His Sister, Ethel Rosenberg, to the Electric Chair, Random House, 2001. ISBN 978-0-375-50013-8. (Prancis) Julius and Ethel Rosenberg, Lettres de la maison de la mort, Gallimard, 1953. (Inggris) Walter Schneir & Miriam Schneir, Invitation to an Inquest: Reopening the Rosenberg Case, 1973. ISBN 978-0-14-003333-5. Schneir, Walter. Final Verdict: What Really Happened in the Rosenberg Case, Melville House, 2010. ISBN 1-935554-16-6. (Prancis) Morton Sobell, On condamne bien les innocents, Hier et demain, 1974. Trahair, Richard C.S. and Robert Miller. Encyclopedia of Cold War Espionage, Spies, and Secret Operations. Enigma Books, 2009. ISBN 978-1-929631-75-9. Yalkowsky, Stanley (July 1990). The Murder of the Rosenbergs. Crucible Publications. ISBN 978-0-9620984-2-0. Zinn, Howard. A People's History of the United States. p. 434. (Inggris) Sidney Zion, The autobiography of Roy Cohn, Lyle Stuart Inc, 1988. ISBN 0-8184-0471-X. Wikimedia Commons memiliki media mengenai Rosenberg trial. Guide to the Playscript about the Julius and Ethel Rosenberg Espionage Trial. Special Collections and Archives, The UC Irvine Libraries, Irvine, California. Timeline of Events Relating to the Rosenberg Trial. Ethel's brother says he trumped up evidence. Heir to an Execution – An HBO documentary by Ivy Meeropol, the granddaughter of Ethel and Julius. Rosenberg Son: "My Parents Were Executed Under the Unconstitutional Espionage Act"—video report by Democracy Now! History on Trial: The Rosenberg Case in E.L. Doctorow's The Book of Daniel by Santiago Juan-Navarro from The Grove: Working Papers on English Studies, Vol 6, 1999. Halaman ini terakhir diubah pada 3 Oktober 2018, pukul 17.15.